Smoothie FAQ! Plus a Vegan Acai Smoothie Recipe. Some say you should eat dessert first. Well I say you should sip your smoothie first, so before I get to the FAQs and Substitutions, here is that yummy Acai recipe I promised. 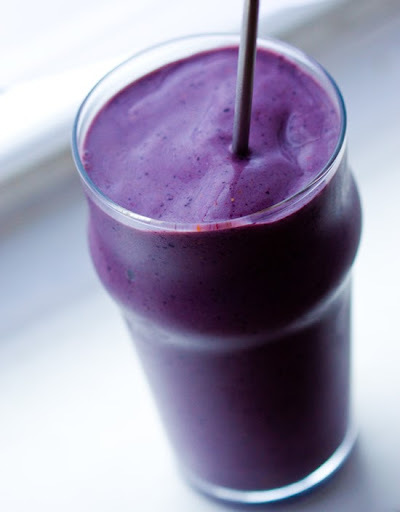 It's rich in berry antioxidants and light and creamy. Super simple too, you should be able to find all these ingredients already in your kitchen - or at your nearest Natural Foods grocery store, aka Whole Foods. Blend. Pour, Sip. Smile. Easy! Q: Why do you put apple cider vinegar into your smoothies? 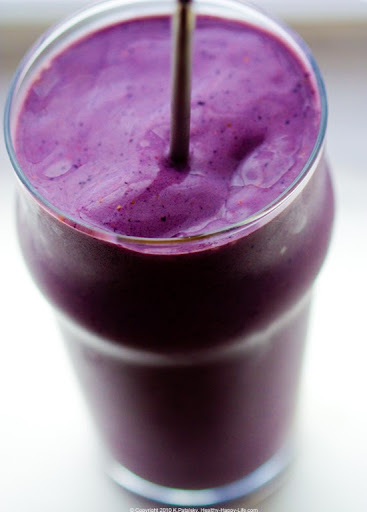 A: It adds a tiny acidic flavor that really tightens and tones all the other flavors in the smoothie. To me, it's kinda like adding triple sec to a cocktail - or a squeeze of lemon to your iced tea - it adds a zesty accent that enhances all the sweet, frosty and creamy flavors in your smoothie. The other natural benefit to apple cider vinegar is the slightly alkaline boost it adds to your smoothie. Apple cider vinegar is one of the oldest health remedies around: (Bragg.com states "In 400 B.C. the great Hippocrates, Father of Medicine, used Apple Cider vinegar for its amazing health qualities.") Adding a splash of ACV to smoothies, juices, salads, baking recipes and entrees is never a bad idea! You can read more about the health benefits of ACV on several health websites - or ACV brand websites like Bragg.com. Apple cider vinegar is unique from other varieties of vinegar - most of which are acidic, while ACV is alkaline-enhancing in the body. See more acid vs. Alkaline foods in this Wolfe Clinic Food Chart. But be warned, outrageous health and weight loss claims on apple cider products can be misleading. ACV is a healthy addition to your smoothie and diet - but in no way is it a miracle food. Q: Why do you use coconut water ice cubes? A: I love to substitute plain old tap water ice cubes with coconut water ice cubes. I always have some on hand in my freezer - plus making cw cubes is a great way to use up the last sips of leftover cw bottles and tetra paks. Why do I do it? Well I adore coconut water for the mild flavor and the nutritional benefits - so I try to add it in anywhere I can. Coconut water ice cubes is a smart smoothie tip to sneak coconut water into you smoothie glass without simply watering it down. You don't have to use the coconut water cubes - but if you have some around, they mesh well in virtually any smoothie recipe! See my Coconut water ice cubes post here. 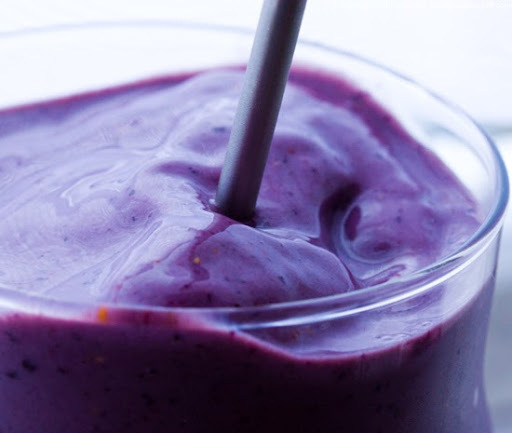 Q: What's the difference between non-dairy milks (soy, almond, hemp, etc) for smoothies? A: I love my good old standby of soymilk. I specifically like vanilla soymilk in fruit smoothies. Soy Dream is a delicious brand. But my next choice for a non-dairy creamy beverage is hemp milk. I adore hemp milk - but quite frankly I don't always have it on hand. Next up would be almond milk. And lastly I'd try rice milk. But rice milk is probably my least favorite milk to use in smoothies - simply because it lacks a rich creaminess in its texture. Q: Why do you specify fresh vs frozen fruit? A: Simple, it's all about taste and texture. Fresh fruit is incredibly delicate and full of flavor! But it really doesn't hold up on its own if you want a rich frosty smoothie. So I usually combine a little bit of fresh fruit (for fresh bold fruit flavor) with a nice boost of frozen fruit for texture and a milder fruit flavor. Do a taste test of a ripe fresh strawberry vs. a frozen one. The difference in flavor and sweetness is usually substantial. However, frozen fruit retains nutrients quite well and adds that frosty texture we all love, so it's definitely worth adding to your smoothies! And as I say in my 20 smoothie tips, always add fresh fruit last in the blending process, so that you don't over-mush the taste and texture of it. Q: What's the difference in sweeteners for smoothies? A: I commonly add a little drizzle of agave or maple syrup to my smoothies. Maple syrup tends to be waterier and less likely to gel up in a smoothie. While agave can act a bit like honey if it gets too cold and get sticky. You can substitute agave for maple in a 1:1 ratio. And if you don't have either of those sweeteners on hand, you can always add in a 1/2 a banana for added sweetness or even exotic sweeteners like brown rice syrup and such. Q: Why do you add in little bits of random ingredients? A: Sometimes I'll add in a splash of lemon juice, a grind of ginger, a sprinkle of cayenne etc. But these are the little touches that make smoothies personal and unique - and cravable! No, you don't have to add the little accents of cayenne, cashews, flax seeds, coconut or grind of ginger to your smoothie - but if you have the ingredients and want to be adventurous, go for it. And creativity is the key. You can easily make tiny modifications to my recipes based on your own tastes and cravings. I like to simply act as inspiration for your own smoothie and blender adventures. Q: Raw nuts in a smoothie? Why? A: I love adding a handful of raw nuts to some of my smoothies. Raw cashews are my fave. It adds a nice boost of nut nutrients and fiber - as well as adding texture and body to the resulting recipe. Q: What do I do if I don't have a juicer for the fresh juice ingredients? A: Buy a juicer! Juicing 101 should convince and guide you. No, no I kid. You don't need to buy a juicer, although I adore using mine for fresh juice blends. You can always use store bought juice - just try an buy high quality brands - preferably juice that is not from concentrate. Q: What is this stuff... chai tea concentrate, vanilla soy chai beverage, cashew juice, coconut water, coconut water ice cubes, spirulina, aloe juice, probiotics and hemp milk? *Chai Tea Concentrate is a sweetened chai tea beverage in concentrated form. You can't drink it on it's own - but it is great for making soy chi lattes and adding to recipes and smoothies. If you can't find this ingredient, use deeply brewed chai tea with a bit of liquid sweetener as a substitute. *Vanilla Soy Chai Beverage is specifically a drink from Bolthouse Farms. I buy it at Whole Foods. If you can't find it, simply use 1 part soy milk to 1 part chai concentrate as a substitution. A dash of vanilla extract would be helpful too - or use vanilla soymilk. *Cashew Juice is a unique beverage I buy from the ONE brand. They are mostly known for their coconut water - but the cashew juice is a trip! It's tangy and sweet and has a long list of (unconfirmed) health benefits. Find it at Whole Foods. If you can't find it - sub apple juice w/ a bit of lemon juice. More here. *Coconut Water Ice Cubes see here. *Spirulina is a green superfood powder. Learn more about it in this spirulina facts post. My Green Powder Taste Test here. *Hemp Milk is a nondairy beverage that is gaining popularity for its high protein content as well as the high quality of the protein. Hemp, like soy, provides a complete protein - as well as a whole slew of other nutrients. More hemp info here and a hemp smoothie. Q: What blending/juicing equipment do you use? A: Meet my Orange X Citrus juicer here. Meet my SuperAngel Juicer here. I also did a Blender comparison review here: Blendtec vs. Vitamix vs. Oster fusion. And my Juicing 101 post is filled with tips! Sometimes you don't have fresh mango. Or you have 3 bags of strawberries, but no blueberries. I know, I've been there. Here are a few ingredient subs that are suitable for my smoothie recipes. note: some flavor profiles may be altered, so if you are subbing ingredients - use your palate to guide you. Fresh ripe Banana----hard to sub a fresh banana - they truly are a smoothie's best friend. General Substitutions Rule for Fruit: Sub fruits with similar tastes and textures. Take the zestiness, creaminess, sweetness, seediness and sourness into account when finding a suitable sub. Fresh/Frozen note: most fresh ingredients cn be subbed with the frozen version of the same ingredient, say frozen strawberries for fresh strawberries - just take care to add a bit more liquid so the consistency doesn't get too icy and thick. And on that same note, you can sometimes substitute a fresh ingredient instead of a frozen one. Say fresh blueberries for frozen blueberries-just be sure to add less liquid and a bit more ice. Any more??? Let me know your substitution questions in the comments and I'll add them to this list.